More Americans now get their news online than from print newspapers — 46% vs. 40%, according to Pew Research Center’s Project for Excellence in Journalism (PEJ). At 50%, television is the only medium that tops the Internet as a news source. “The migration to the web is accelerating,” said Tom Rosenstiel, project director of PEJ. “The quick adoption of the tablet (computer) and the spread of the smartphone is only adding to that.” PEJ, a nonpolitical, nonpartisan research institute funded by the Pew Charitable Trusts, releases an annual report on the American news industry, and the eighth edition was released on March 14. In addition to stats about the industry in general, “State of the News Media 2011” (SONM) contains a survey of how people use mobile technology to get local news, produced in association with the Knight Foundation (“Mobile News & Paying Online“); a report comparing the U.S. newspaper industry with those in other countries (“International Newspaper Economics“); and two reports on community news websites (“Economics of Community News” and “Seattle: A New Media Case Study“). SONM describes local news as a “vast untapped territory.” The “Economics of Community News” special report found that local news sites are putting more effort into crowdsourcing content and into curating that content. Community media sites are also putting as much energy into securing revenue streams as creating content. For now, it appears those revenue streams will not include paid subscriptions, according to SONM stats, as shown below. Thankfully for them, a good portion of online ad spending is local — 40%, up from 30% just a year earlier. Local stations also brought in $1.34 billion from online and mobile advertising in 2010, up 8% from the year before. 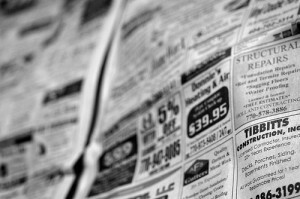 Local ad growth is not just limited to online outlets, however. Auto advertising jumped 77% in local television, and political advertising dollars spent on local television are estimated at a record $2.2 billion. SONM credits two items for helping with the slight recovery of media in general during 2010: the federal bailout of the auto industry and the Citizens United decision by the U.S. Supreme Court that allows corporations and unions to buy political ads for candidates. One of the obstacles to larger growth of online news is that the industry as a whole needs to come to an agreement about how to measure audience, which is a necessary figure for advertisers. Another hurdle is losing control of revenue and consumer data to other entities. “The biggest issue ahead may be that in the digital realm the news industry is no longer in control of its own future,” writes Rosenstiel and Amy Mitchell of PEJ in the “Overview” of SONM. Image by Cameron Cassan, used under its Creative Commons license.